It’s amazing how quickly you can become accustomed to a touchscreen user interface. If you’re using Windows 8, you’ve no doubt reflexively reached out and swiped your finger across your desktop monitor at least once—likely with no effect, since it’s probably not a touchscreen. Fortunately, affordable touchscreen displays are finally making their way into the market. I recently spent some time with two such models: the Dell P2314T Touch Monitor and the Samsung S24C770T 10-point Touch Monitor. One is definitely better than the other. Dell’s 23-inch P2314T is the better of the two touchscreens reviewed here. The Dell P2314T is a 23-inch display based on an IPS (In-Plane Switching) panel, and the Samsung S24C770T is a 24-inch model based on MVA (Multi-domain Vertical Alignment) technology. Both use LED backlights and deliver a native resolution of 1920 by 1080 pixels with ten touch points. Both monitors are mounted to easily adjustable stands that can hold the display upright, like a standard monitor, or reclined at a low angle that’s easier on the arms when you’re using the touch features. Neither stand requires you to push any buttons to adjust the angle: You simply push or pull the screen into the angle that works best for you. Despite that flexibility, both stands feel sturdy and solid on a desk. 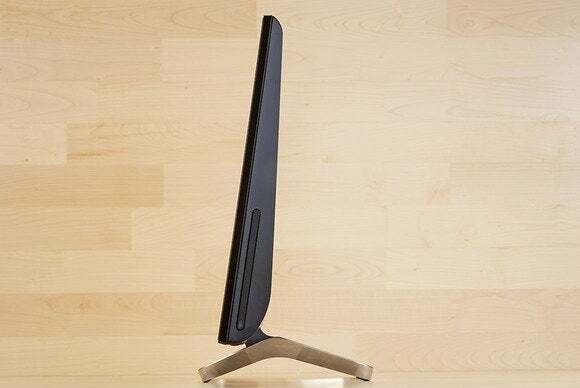 The Samsung S24C770T has a superior stand, but its color fidelity isn’t as good as the Dell model’s. The Dell lies flatter than the Samsung by a few degrees, but the Dell’s stand sticks out from the front by a couple of inches. This design leaves less room for a keyboard in front of the monitor, and it adds to the distance your arms must reach to touch the screen. Both monitors have highly reflective screens, and when I put each in its reclined orientation, both reflected the overhead lights in the office, producing intense glare. You’ll want to consider your working environment before purchasing either model. Dell provides plenty of ports on its P2314T: You’ll find DisplayPort, HDMI, and VGA video inputs, and two USB 3.0 downstream ports for connecting peripherals or portable storage devices. The Samsung S24C770T is outfitted with two HDMI ports—and that’s it. The Samsung monitor also lacks a USB hub. If you need speakers, though, the 3-watt pair built into the Samsung model’s bezel aren’t bad. Dell expects you to provide your own audio hardware, which can be a problem if you have limited space on your desk and don’t want to wear headphones. Dell’s monitor offers DisplayPort, HDMI, and VGA connections. It also has a USB downstream port plus MHL support. The Dell P2314T also supports MHL (Mobile High-Definition Link), a technology that enables you to connect a compatible smartphone or tablet and display video (up to 4K resolution) and stream surround sound (up to 7.1 channels, including TrueHD and DTS-HD) while simultaneously charging the attached device. Samsung not only manufactures smartphones and tablets, but is also a member of the MHL Consortium, so it’s interesting that Samsung’s monitor doesn’t support the technology. Overall, I found the touch capabilities of the two displays to be quite similar. I was able to use Windows 8 gestures to pinch, zoom, swipe, and type without any noticeable latency. Typing using the on-screen keyboard worked well, though I won’t be giving up the superior tactile response of a standard keyboard anytime soon. Comparing the displays side by side, I found that the Samsung’s MVA panel had a slight pinkish hue. I preferred the neutral grays and color of the Dell’s IPS panel. Extreme off-axis viewing isn’t as big of an issue for a touchscreen display, since you’ll typically be situated front and center, but it will remain important when you’re sharing information with someone else. The Dell model looked much better when viewed at an angle. The Samsung monitor increasingly lost contrast as I moved away from its center, and images gradually disappeared as I moved to the far left or right. Samsung’s S24C770T has dual HDMI ports, but the monitor's USB capabilities are upstream only (to support touch). Text was clear and legible on both displays, but the whiter whites and the slightly higher pixel density of the Dell helped make text on that monitor a little easier on the eyes. The Samsung has good speakers, but it costs more and has fewer I/O ports, and its colors leaned a little on the red side. For my money (and by that I mean your money), I recommend the Dell P2314T with its raft of ports, its neutral grays, and its lower price. Samsung's S24C770T has a superior stand, but its color fidelity and off-axis viewing aren't as good as they could be. And at this price point, we expect more input choices than just dual HDMI. This is a very good touchscreen display, with all the video inputs you could ask for, plus a USB hub and MHL support for mobile devices.